Here's my monthly pac tom update. I've been escalating my attempt in order to improve my chances of finishing before I graduate; aside from the obvious stuff like running more often and for longer distances, I've also been planning my routes more carefully. I now usually draw or print a map before I go somewhere, so that I don't miss a little street somewhere, and I'm also now using an "outside-in" style where I try to run the most distant streets (edges of the city) before the inner streets. If I do that then I'll waste less time later because I won't need to run through inner sections I've already covered thoroughly on the way to outer sections. 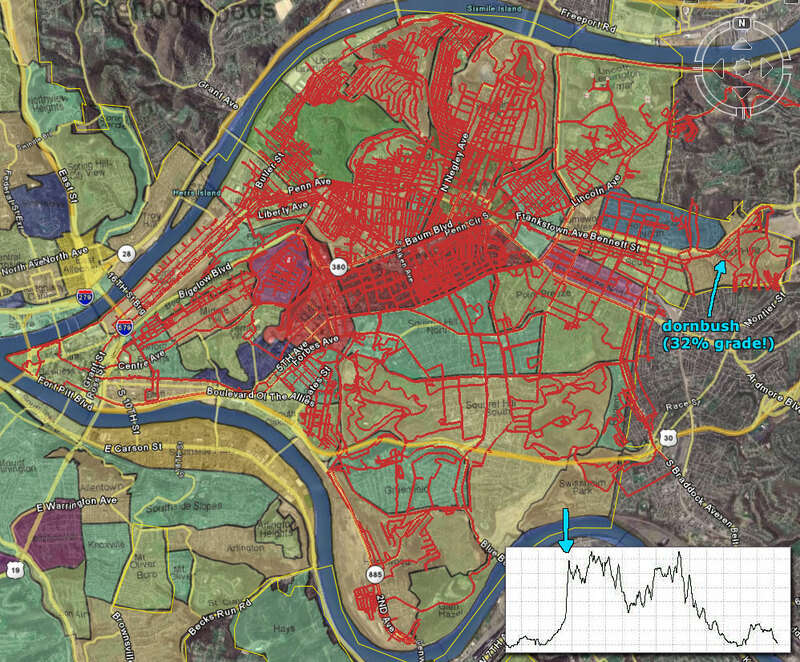 So, I hope that after doing this, the big empty spots in the map like Squirrel Hill will fall fast. Neighborhoods totally done: Friendship, Garfield, Morningside. Very close (1 or 2 more trips): Shadyside, Upper Hill, Strip, Larimer, Central and Upper Lawrencevilles, Stanton Heights, East Hills. Yesterday I took a trip to Dornbush St. in the East Hills. This is the second steepest street in Pittsburgh and the eighth steepest paved road in the US (slightly steeper than Filbert St. in San Francisco) at a 32% grade. 32% means that for every 100 feet traveled in the horizontal, there's a rise of 32 feet. That is really steep!! Check out the preposterous uptick in the elevation chart at the bottom right of the image. If you live in Pittsburgh, you can compare the popularly tilty Negley Ave.—it is less than half as steep at "only" 15.8%. Pittsburgh's steepest street, Canton Ave. is 37%, probably making it the 1st or 2nd steepest paved road in the world (depending on what you count). That's not in my goal area ("continental Pittsburgh") but it I do hope to make it out there just for fun some day. COME TO BEECHVIEW!!!!!!!!!!!! Canton Ave is like 1 minute from my house! You are so lucky to have these steep streets. That must be fun. I don't think we have any like that around here. I ran down a pretty steep street when I was in San Francisco, but I didn't see Filbert and 22nd. Too bad -- it looks like I really missed out on those Filbert Steps. I will, Adam! Can you offer me some Gatorade when I'm there? Because it's like 8 miles from my house... probably longer since I can't run through the tunnels. Pac Tom sighting: Saturday. 2:20PM. Going down the hill at Negley and Fifth. Probably at that point I was looking pretty sorry, since I usually only go that way on the way back.